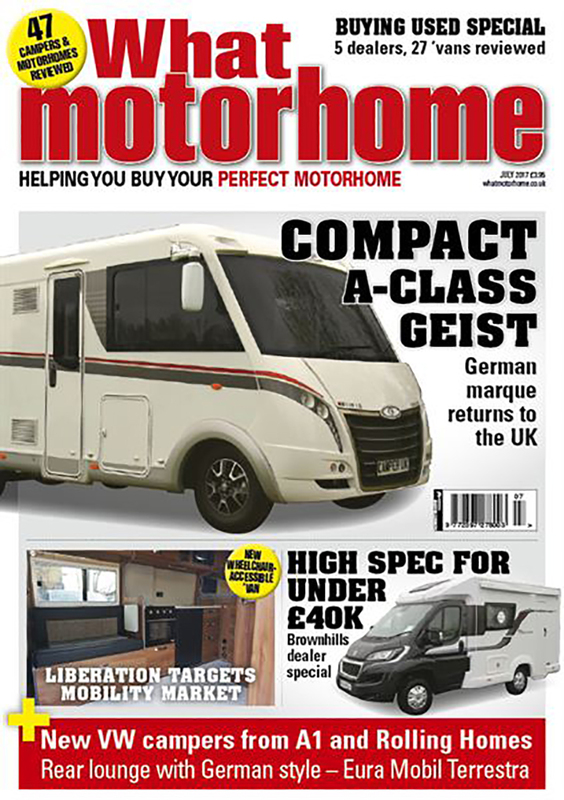 We are very proud to announce that Brook Miller Mobility’s Liberation disabled access motorhome will feature in the July edition of What Motorhome. Available online as well as in many major shops and supermarkets, What Motorhome Magazine has been providing expert advice to motorhome buyers since 1986 and has, with these many years of experience within the motorhome industry, now has an unrivalled knowledge. So with this in mind we are absolutely delighted with the excellent write up they have published in their July issue, and an image of the Liberations stylish and high quality interior finish features on the cover of the magazine, as well as many more images and information on the wide range of adaptions that are available for the disabled motorhome user and layout details within. For those of you who don’t already know; The Liberation is a newly launched disabled access motorhome which Brook Miller Mobility has been developing along with RP Motorhomes based in Harrogate. RP Motorhomes produce top quality motorhomes, the Liberation is converted from the Fiat Ducato extra-long wheelbase panel van. The Liberation can also accommodate our very own Libby wheelchair accessible tow car. Once the base vehicles have been trimmed to perfection by the team at RP Motorhomes, (and trust us when we say they’re high quality this isn’t an understatement, you need to see one of their motorhomes to really believe the fantastic finish they offer), your Liberation Motorhome will come to our Brook Miller Mobility workshops in Elland, West Yorkshire. As each motorhome is made to order, especially for each customer, there are many options available to meet both the mobility requirements as well as a range of optional extras to ensure you get the most out of your camping experience. Find out more information about the Liberation Motorhome here. You can also see one in the flesh at the Midsummer Motorhome Show, Stoneleigh.